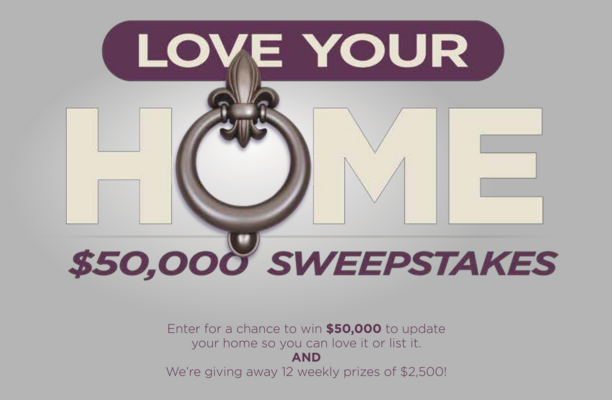 Building on the tremendous success of the 2015 $50,000 Sweepstakes, Berkshire Hathaway HomeServices is partnering with David Visentin and Hilary Farr from the HGTV network show Love it of List it to host the 2016 Love Your Home Sweepstakes. During this sweepstake Berkshire Hathaway HomeServices will be giving away another $50,000 to one lucky winner to update their home. Not only is there a $50,000 grand prize this year, but starting March 28, there will be drawings each week for one contestant to win $2,500. This weekly drawings will be continuing each week until June 13. That’s 12 additional winners! To enter all you have to do is visit LoveYourHomeSweeps.com for your chance to win $50,000 to update your home so you can love it or list it! PRIZES: (1) Grand Prize of $50,000, (12) Weekly Prizes of $2,500. HOW TO ENTER: Visit LoveYourHomeSweeps.com and fill out the entry form.